1.Buried utilities such as water, electricity, gas, telecommunications and more. 2.Foundations on buildings, bridges, etc. 3.Underground structures such as tunnels subways, buildings, mines and more. Two big changes are currently happening in these areas. First, the materials used in the built environment are evolving, and second technology such as sensors, controls and robots are helping with construction, maintenance and operations. “Technology is playing a key role, both in terms of information-based solutions, automatic controls, and robotics,” explains Dryver Huston, professor, The University of Vermont. He adds that durable polymer pipes with less steel are becoming much more common, as is the use of high-performance concretes. A closer look at how utilities and tunneling technologies are advancing gives a glimpse into how underground construction will evolve in the months ahead. Underground utilities consist of a network of conduits including water mains, sewer pipes, phone, cable and power electrical circuits. Putting the pipes underground has many advantages, but one large disadvantage—underground pipes are out of sight and often neglected, according to Steven Folkman, professor, Utah State University. Today, water and sewer systems in many cities are decaying and water main breaks are becoming more common. The University’s Buried Structures Laboratory recently published its second study on break rates of water pipes. The research shows that there were 23,803 pipe failures that needed repairs and that break rates have increased 27 percent in the past six years. Break rates for cast iron (CI) and asbestos cement (AC) pipes represent almost half of the installed water mains in North America, and have increased 46 percent and 43 percent, respectively, since 2012. Further, the study shows how water main failure rates for CI and AC pipes could increase exponentially. Folkman explains that older CI and AC pipes are near or past their expected life and need to be replaced soon. Another observation he makes is that the rate that existing pipes are being replaced is on a 125-year replacement cycle. The challenge is the typical age of a failing water main is 50 years. The good news is there are new pipe materials and installation methods being developed that can help in the underground construction of utilities. 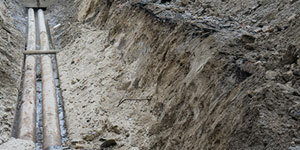 The traditional approach to new pipe installation—open cut—is where equipment digs a trench and new pipe is installed. Directional drilling has gained more popularity in the last five to 10 years. Still, one of the biggest challenges is the lack of funding. With a growing amount of water main inventory that is beyond its expected life, utilities lack the funds. According to the results, smaller cities are having the most trouble right now with their water infrastructure, but if funding mechanisms for infrastructure investment can be developed at the federal government, this could happen at a faster pace. 1.The diameter and size of tunnels has grown. 2.Tunnel boring machines leave little damage to the surrounding buildings. This new equipment is critical, as damage has stopped some from tunneling in the past. For instance, the Los Angeles Metro stopped tunneling for more than 20 years, according to Mike Mooney, professor, Colorado School of Mines. Invented by James Henry Greathead, a tunnel boring machine can excavate tunnels with a circular cross section and can bore through anything from hard rock to sand. One example of this is Bertha in Washington State, which completed tunneling on the Alaskan Way Viaduct last year. This machine was specifically built for the Washington State DOT to use on the tunnel project in Seattle. While this is one example, tunnel boring machines give contractors a tool to tunnel in urban environments with less risk, according to Mooney. One example comes from The Robbins Co., which offers a number of different products for tunneling. The tunnel boring machines are designed with worker safety in mind, and the company also offers training for equipment operators. At the end of last year, the company announced that two of its machines are being used on the Mumbai Metro line 3 and will excavate parallel 3.5 km long tunnels between Mumbai Central and Worli station sites, passing through three intermediate cut and cover stations along the way. These are the first of a total of four machines that will be provided on the project. These types of machines offer new opportunities to improve worker safety on projects, while also leaving little damage to the surrounding buildings. In general, underground infrastructure has evolved in terms of usage, age, condition, and the role in public and policy and planning. Further advances include digital mapping, increasingly sophisticated low-cost robotics for excavation and maintenance, distributed sensors for automated condition assessments, and advanced materials, according to Huston.